While the plank may be one of the best total-body exercises, its benefits begin to decrease as you get better at doing it. Try these five modifications to pump up your traditional plank and keep your body improving! As with all exercises, the more you practice, the better you get. So if you want to continue seeing results from your workouts, you must continue to challenge yourself. This is no more evident than with everyone’s favorite core exercise, the plank. Perkins, a certified strength and conditioning specialist, says that once we’re comfortable with a traditional plank, we should be trying more dynamic versions to continue building strength and sculpting our bodies. This is the most basic modification you can make to the traditional plank. Start with both feet planted hip-width apart on your hands or elbows. Lift one leg and hold for 15 seconds. Repeat on the other leg. Alternate for as long as you can hold your plank. Starting in a traditional plank with your hands shoulder width-apart, bring your knee to the outside of your shoulder, turning your head to meet your knee. Repeat on the other side. Aim for two sets of 30 reps per side. Start on your hands in a traditional plank. Bring your knee to the opposite elbow, contracting your abdominal muscles as you twist. Repeat on the other side. Aim for two sets, 30 reps.
Want more? Once your knee reaches your elbow, extend your leg. You’ll need a 3- to 5-pound weight for this exercise. 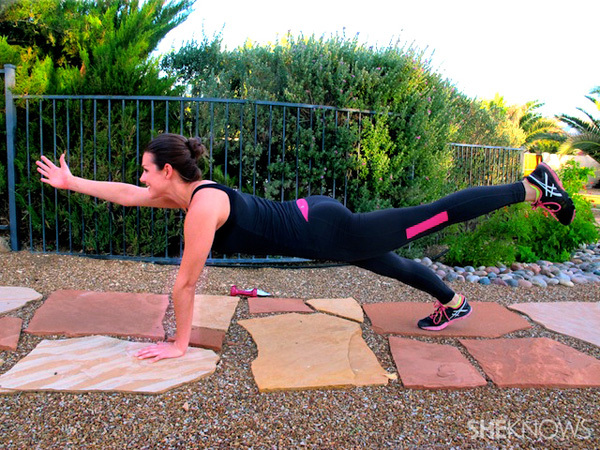 Start in a traditional plank, with the weight in one hand. 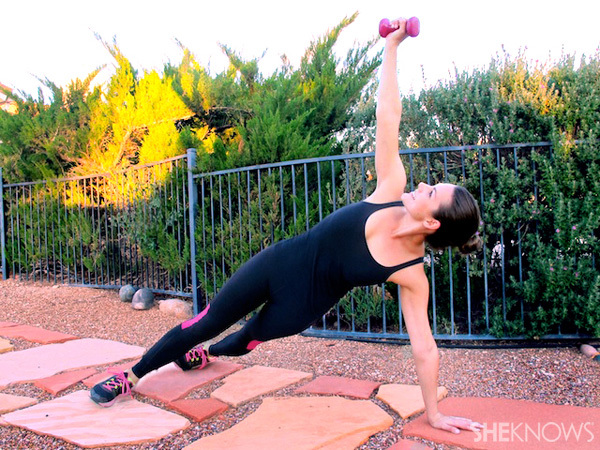 Rotate your arm, lifting the weight to a 90 degree angle above your body as you turn into a side plank. Return to the start. Repeat for 15 reps per side, two sets. Make sure to keep your arm straight and your back flat. Similar to the previous exercise, start in a traditional plank, then lift one leg. Once you have your balance, lift the opposite arm. With your gaze forward, stretch your arm and leg as much as you can. Hold the pose for 15-30 seconds. Repeat on the other side. Want more? Try bringing your knee to meet your elbow under your body for 15 reps.
Too difficult? Modify by dropping a knee. When you’re ready, try the full exercise.